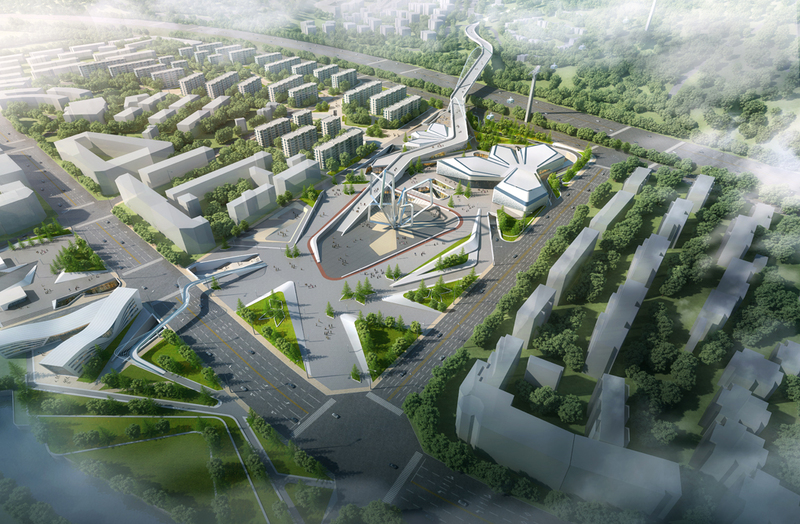 GroupGSA has won a competition to design the Chongli City Centre project in Chongli, Zhangjiakou, China, which will be used during the 2022 Winter Olympics. Chongli District will host the ski jumping, biathlon, cross-country and freestyle skiing and snowboarding events at the Olympics from February to March 2022 and the new centre will also combine social, cultural and economic aspects for Chongli’s future development. To create its design, GroupGSA studied the surrounding landscape, the dynamic of the sporting activities being hosted and geometries particular to winter weather conditions such as sleet and snow. A design concept evolved that captures the hexagonal features of snowflakes, the dynamic flow of the winter sports to be hosted and the curvilinear ski tracks that meander through the mountains skirting Chongli. The city design connects residential buildings, city plaza, city park, exhibition centre and Ice and Snow Museum, and commercial centre with a perpendicular snowflake-shaped sculpture to house the 2022 Winter Olympic flame, which rises from the centre of the city. At night, colours drawn from the iconic Olympics rings will add more life to the design and during the game, sculpture lighting will change to a deep red to create a vivid image of the Olympic flame.